The Hindu god Shiva is said to know and see everything. His third eye has the power to burn away evil -- the unnecessary -- to clear a path toward newness. 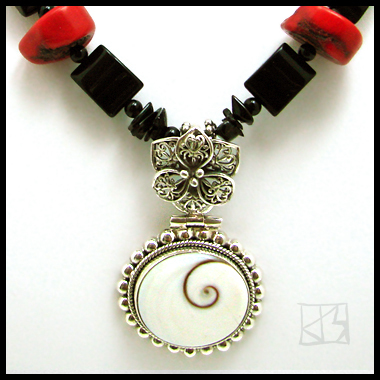 At the center of this piece is a beautiful slice of Shiva's Eye shell set in a frame of Bali silver that is hinged to an elegant openwork flower. 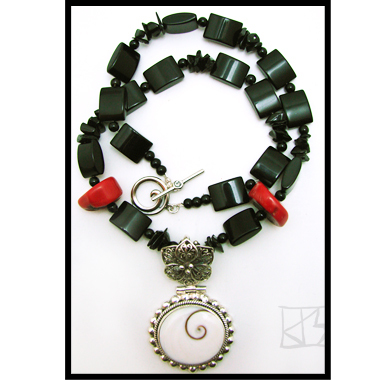 This pendant hangs from a selection of of black onyx in three shapes and sizes -- pillows, rounds, and nuggets -- and two chunky slices of deep-sea coral. 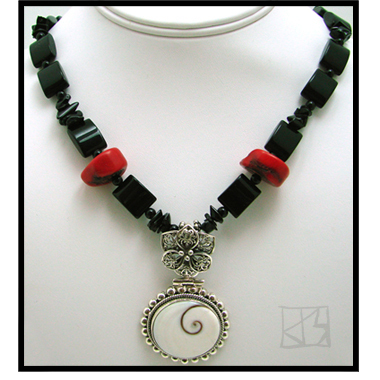 A whorl of silver, which echoes the central pattern anchors the closing toggle. In many cultures a swirling pattern represents the infinite, the never-ending cyclic process of life. It's a favorite of mine as it illustrates hope and endless possibilities, and a spiritual enthusiasm for the unknown. MORE VIEWS OF shiva's vision SOLD!